Funeral Services for Mrs. Evelyn Harris-Sapp will be held on Friday, September 21, 2018 at 1:00 PM at White Springs Baptist Church 8625 Old Knoxville Road, Lizella. Pastor Kendrick K. Mack, Sr. will officiate. Interment will follow at the White Springs Baptist Church Cemetery. 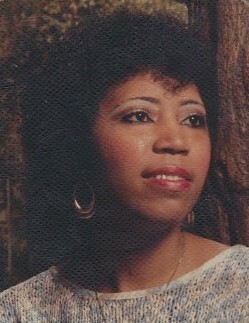 Mrs. Evelyn Sapp was born on May 22, 1960, to the late William Gibson and Stella Mae Davis. Evelyn was educated in Bibb County Public Schools. Early in life, she accepted Jesus Christ as her Lord and Savior. Evelyn was a dedicated and loyal former employee at the Medical Center of Central Georgia for 25 years, and Kroger for 15 years. Evelyn is survived by her husband, Earnest E. Sapp; two devoted daughters, Derinda Harris (fiancé Cedric Dumas) and LaQuita Harris; stepdaughter, Tawanna Sapp; stepson, Earnest; five sisters, Cynthia Harris, Shirley (Ronnie) Causey, Maxine Steele, Tracy Holt, and Janice Ellerbee; two brothers, Cedrick (Lartralia) Davis, Sr., and Wilmon (Gracie) Gibson; three aunties, Lottie Dudley, Evelyn (Eddie) Dotson, and Louise (George) Crawford; two devoted uncles, Alfred (Carrie) Harris and Forest (Sharon) Harris; devoted granddaughters, Sierra Daniels, LaQonia Harris, DeSeana Cloud, Ashley Harris, Harmoni Lawler, and Teiunna Sapp; one grandson, Padrean Poole, Jr.; four sisters-in-law, Della Sapp, Carolyn Felton, Martha Sapp, and Jean (Anderson) Taylor; one brother-in-law, Jeremiah Sapp; a special, loyal devoted friend, Mrs. April Williams; and a host of other family and friends that loved her dearly. Mrs. Sapp will be placed in the sanctuary of White Springs Baptist Church at 11:00 AM, the family will receive friends at the home of her daughter Ms. Derinda Harris at 60 Bolingbroke Circle, Juliette, Georgia.